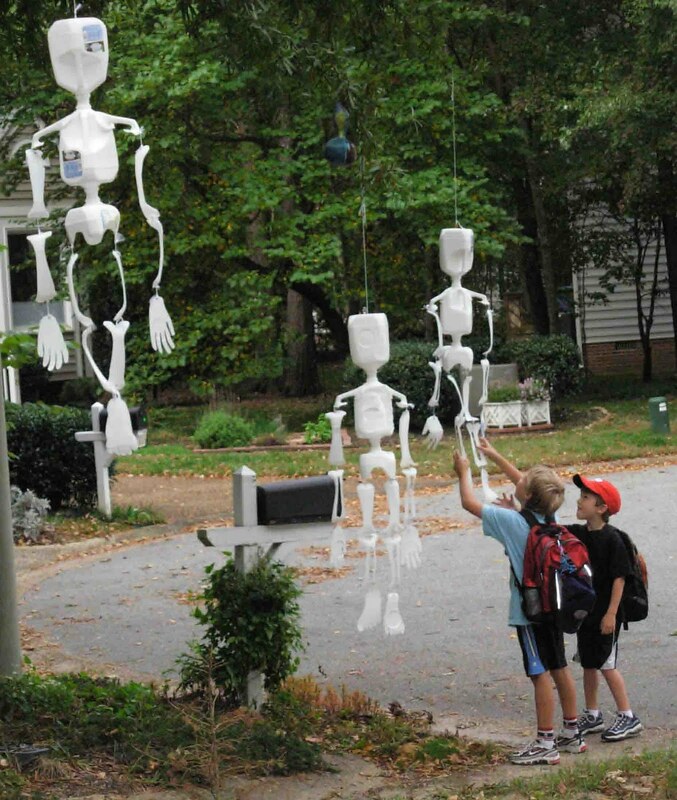 Milk jug skeletons... A perfect blend of crafty fun and recycling! Jiggly joy for all ages! Halloween decorating at it's thriftiest! 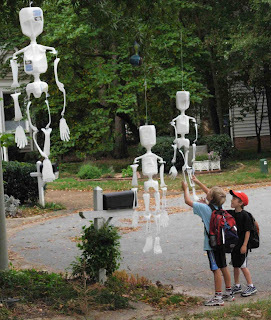 All you need are plastic milk jugs, a hole punch, scissors, hot glue, and string. Well, actually, you need at least 5 milk jugs. 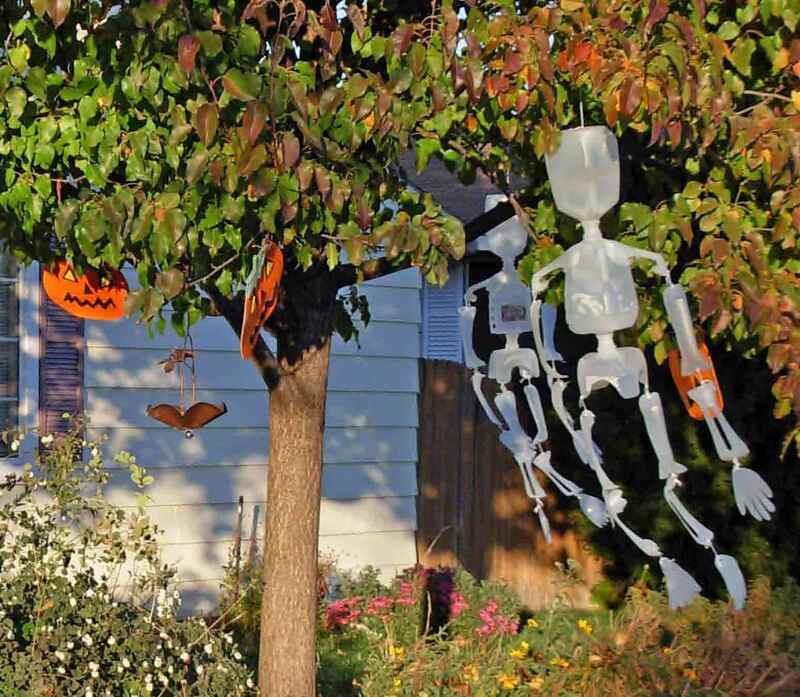 So if you don't drink a lot of milk, and start planning NOW to avoid diving through your neighbor's recycling bins the week before Halloween. In a pinch, your local coffee bistro will save them for you. I like the white ones best, hosting organic milk in our area. The opaque ones work too, but the white shows up better at night. I recommend starting to cut the pieces as you collect them, because things get so busy toward the end of the month that it easy to run out of time. 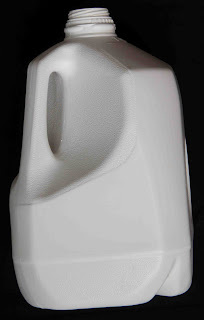 Out of one jug, you'll need to carve a face. The big circles on the side of the jug are perfect for eye holes., or have your kids draw the face on with a marker so you can cut one to make it personal for them. Out of another jug, cut out a rib cage. You can see from the photos that I've used different designs over the years. Don't let yourself be picky here, anything'll do. 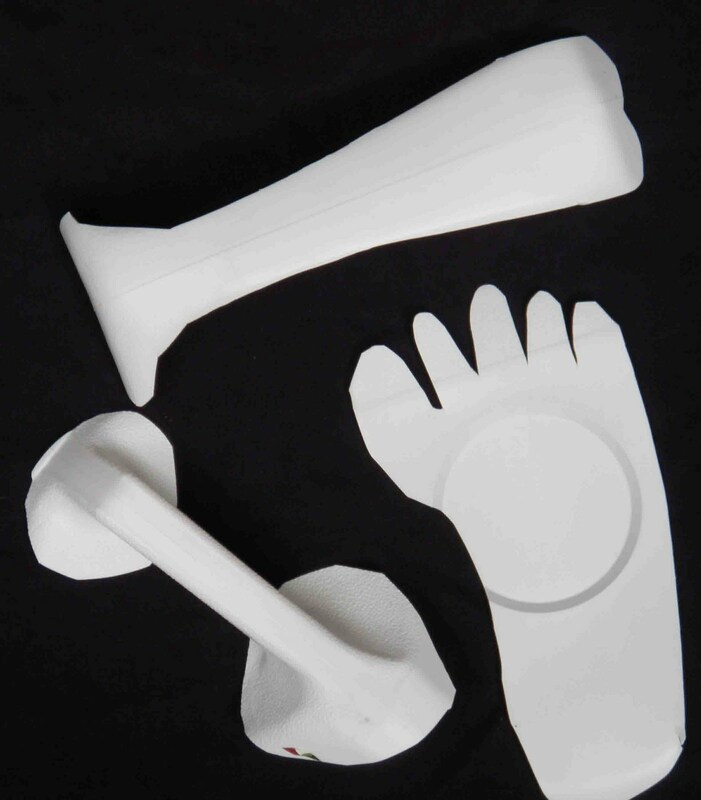 You will also need hands and feet (tracing your kids' is a fun way to make it personal), cut from the sides of the jugs. 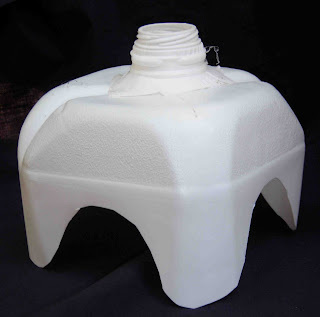 You'll need two jug handles, one for each shoulder. Hot glue one end to the rib cage piece and punch a hole in the other end for attaching arm bones. 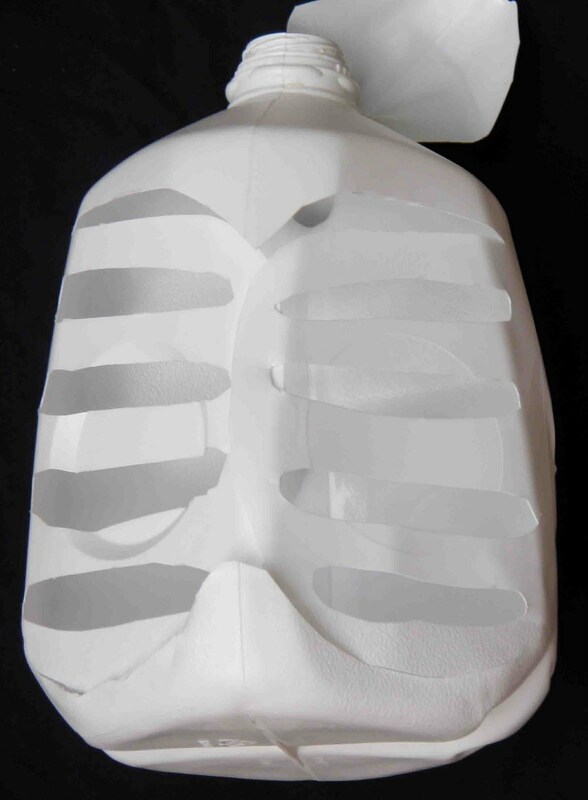 You'll need eight leg/arm pieces, hole punched at each end. 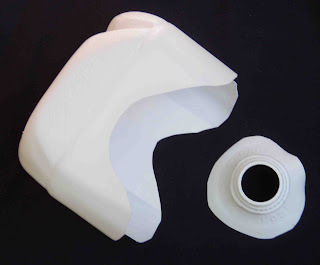 These are cut from the jug's edges, so you get three per jug. Add a middle elongated hole into half of the arm and leg pieces, if you like. You'll need one bottom half of a jug for the hip bones, by cutting a rounded arch on each of the four sides. Punch a hole onto two opposite sides for attaching legs. 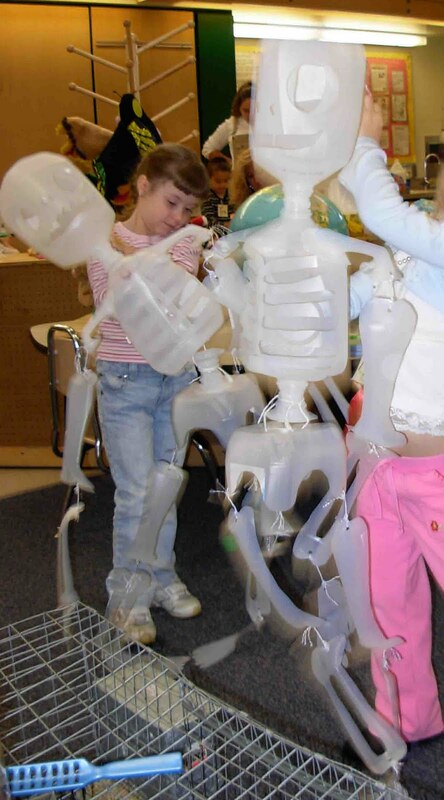 You'll need an extra TWO spouts for connecting the hips to rib cage (hot glue together and to hip/rib pieces). 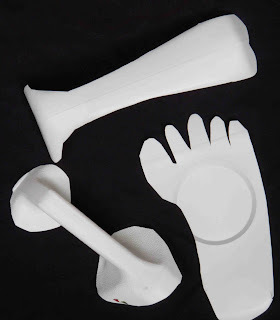 Punch holes in the arm, leg, hand, and feet pieces then connect them with string. 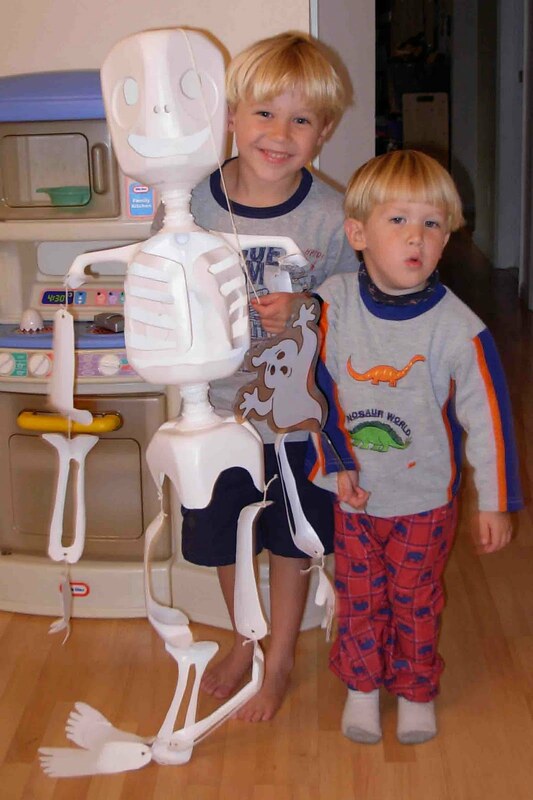 We brought these to school for a Halloween party and danced to a skeleton song. 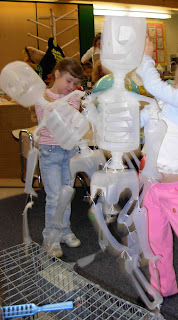 Be sure to reinforce connections with string instead of just hot glue though, as some of the dancers may really get into it and put that hot glue to the test... A great song for this is Spooky Scary Skeletons, by Andrew Gold. His album, Halloween Howls, is a fun collection of classics for children's parties. Meanwhile, you might have so much fun with this that you'll want to craft a whole flock. 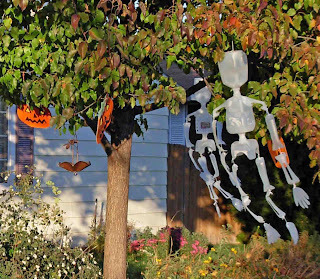 They look really fun flying in a tree next to some foam pumpkins... sure to catch you a few comments from trick-or-treaters! 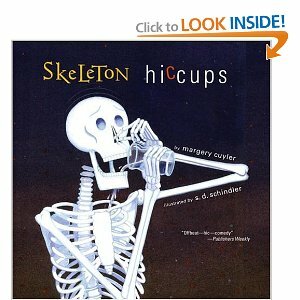 For a fun story to go with these guys, try Skeleton Hiccups, by Margery Cuyler. For more Halloween fun, check out the Mega Spooky blog, http://www.megaspooky.com/, all Halloween, all the time! Now I just need to save 15 cartons so all of my kids can do it. Don't forget the parents, too! I once collected enough to make a dozen for a halloween party. And then, cut all the pieces except hands, feet and faces. Phew! What was I thinking?